A struggling mum has revealed the heartbreaking comment her son made about Christmas as she struggles to pay for food because of Universal Credit. 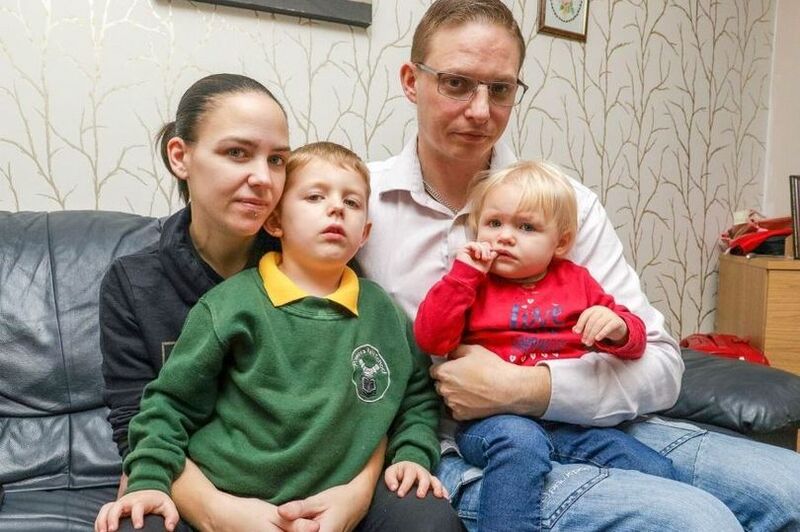 Nicola Joslin, from Witham, Essex, had been struggling to provide for her two young children because of the new benefits system. But her payments stopped completely when her partner Rob moved in three months ago. The family were left were no fixed income and they were served with a possession notice meaning they could lose their home. They are now relying on the money university student Rob receives from student finance to put food on the table and keep a roof over their heads, reports Essex Live. The couple were told last month they had until December to find the cash they needed to pay their outstanding rent or risk being kicked out of their home. And with Christmas just around the corner, times are incredibly tough for the family. Nicola, 29, and Rob, 35, have been together for nearly three years. They have an 18-month-old daughter, Paige, and Nicola also has a four-year-old son, Leo. In April this year, Nicola moved to Witham with her two children, and Rob moved in in September. "They told us we had to apply for a couples claim but this was before Rob moved in," Nicola said. "They said because of the amount of time we spend together we’re classed as a couple. So he moved in and since then it’s all gone downhill. "I was receiving Universal Credit for myself and the children when we first moved to Witham. I was receiving just over £1,200 a month, which went towards the children and £600 was going straight towards rent. "Everything moved over to Universal Credit, even Child Tax Credit. I wasn’t aware of that and was still claiming it. "I got a letter one day telling me I owed £268, they told me the Child Tax Credit had stopped and the money had to come out of my payment." Nicola is currently studying English once a week at the ACL college in Chelmsford and is also taking an online health care course with Vision2Learn. Rob is working towards his goal of a career in security. He is currently studying a three-year cyber security degree at Angilla Ruskin University in Chelmsford, which he started in September. The family's financial situation is even making basic necessities such as petrol difficult to afford. Nicola explained: "We’re now getting nothing at all from Universal Credit and that's been the case since September. "They said because Rob gets £3,000 from student finance every three months it means he can pay for everything else as well. We have a car and house we need to run, and pay as much rent as we can as well as all the university costs he has. "He’s had a passion for it for a long time and I’m not about to tell him to pull out of university because of our situation, missing out on that chance. I’d rather pick my family that I love over money, but it’s unfair that we’ve been put in this situation in the first place. "It is heartbreaking to know the only way we would be financially stable again would be if me and Rob broke up and separated." The family is even struggling with food, relying on mainly tinned and dried items from food banks to keep the children fed. "We’re getting food bank vouchers every week and our health visitor is putting together a Christmas hamper for us," Nicola added. "It’s got us to a point where it’s affecting our mental health badly. "At the moment part of me wants to give up fighting and let everything fall apart, but the other part of me tells me to keep going because I have two kids to fight for. "It’s trying to keep strong and it’s one of the most difficult things I’ve ever had to do." Research by the Trussell Trust, who provide a nationwide network of food banks for people in need, has shown that food bank usage rises significantly in areas where Universal Credit has been rolled out. As well as relying on food banks, Nicola has reached out to people in the local community to help her and the family over the Christmas period. And the kindness of others has shone through, with people donating food, clothes and even money to help the family as much as they can. "We received a card from someone this week and we have no idea who it is," Nicola added. "He enclosed £100 worth of Morrisons vouchers and £15 cash, and he's a complete stranger. "People are aware of the difficulties we face and thankfully they are willing to help. It’s made me want to cry tears of joy because there are so many decent people out there, but at the same time it’s the guilt of taking their stuff. "A lady turned up yesterday with three bags of clothes for Paige and I felt guilty taking it. But if I don’t I feel guilty about not being able to provide for my children. I have to bite the bullet and just accept it, it’s for the kids not me." With Leo and Paige too young to understand their parents' financial difficulties, it's something they've become unknowingly used to. But with Christmas just weeks away, the reality is setting in for Nicola. She said: "We’re relying on second-hand gifts so the kids have something to unwrap for Christmas. "When I picked Leo up from school the other day he showed me the tree on the stage and was saying he couldn’t wait for Christmas to open lots of presents. That really hurt. "It would be hard anyway but particularly because it’s approaching Christmas. It’s another expense we really can’t afford. "On social media people are taking pictures of lots of presents under their tree and my children haven’t even got a tree up yet. That’s what’s hard. I feel like I have to stay strong for them." In November, things went from bad to worse for the family. Unable to keep up with their rent payments, Nicola and Rob received two letters - the first a final demand for outstanding rent arrears, and a second as a notice of seeking possession of their home. The family were told they had until December 16 to pay the arrears in full or make a substantial payment and make an agreement to pay the balance before the notice becomes effective. If they fail to do so, they would face court action and risk losing their home. Nicola claims the family is entitled to a full housing benefit, but their debt is currently too large for their monthly allowance to cover. "There's so much stress and worry," she said. "What are we going to do now? Every day we think that. We lose track of who we’ve spoken to and what needs to be done. "I keep thinking I’m going to have my kids taken away from me because I can’t provide for them and it’s not my fault. That’s what the end result is probably going to end up being if we get evicted, they could go straight into the care system. "We’ve tried to keep in contact with Universal Credit. Rob has tried so many times to contact them and he’s left messages but they never get back to him. They wait for me to get in touch and it takes that to get their attention. "They’ve never once replied to him and it’s supposed to be our joint claim. It feels like they’ve chucked us these problems and told us to get on with it. They’ve left us with nothing to live on."